Its envelope-based budgeting will keep you on track. Mvelopes mines the same tried-and-true envelopes budgeting system as You Need a Budget and Dave Ramsey’s Every Dollar, explicitly telegraphing the fact in its malapropic name. The app doesn’t look as polished as some of its competitors’ offerings, but its system is sound and easy to grasp even if you’ve never created a budget before. Note: This review is part of our roundup of the best budgeting software. Go there for details about competing products and how we tested them. Mvelopes walks you through a four-step setup process of syncing your bank accounts, defining your income, creating a budget, and funding your envelopes. Adding your various banks is easy. Mvelopes displays clickable tiles for fast access to the most popular financial institutions. On the off-chance your bank isn’t among them you can search the database for it. If your bank isn’t supported, Mvelopes provides a New Institution Request form and promises to respond within two to four days. Setting up Mvelopes is a four-step process and the program guides you through each. Once your bank accounts are added, Mvelopes scans your transactions for deposits to suss out your income. This works best if you have a fixed income with a consistent deposit amount, such as when you receive a salary. If you’re an hourly wage worker, it may be more problematic. For instance, Mvelopes correctly identified my wife’s biweekly deposits as a regular paycheck but couldn’t account for the fact that the deposit amounts varied. It arbitrarily grabbed one deposit amount—curiously not the most recent one—and populated the biweekly income field with that number. Mvelopes earns point for providing a separate input for folks who have variable income, though it requires you to project what you will make each month. As any temp worker or freelancer can tell you, even the most careful estimations are frequently derailed by late payments or unexpectedly fallow periods. With your income entered, you can create your budget. Mvelopes provides a basic template with pre-populated expense, savings, and giving categories —though you can personalize these—and you simply enter monthly payment amounts for each. There’s also a section for irregular expenses like auto and home maintenance and vacations. Mvelopes helps you enter your income whether you get a regular paycheck, receive variable payments, or both. Once your initial budget is created, it’s time to fund your envelopes. You do this by assigning amounts from your Income Cash Pool—the total of all your bank account balances—to each budget category, either as a flat dollar amount or a percentage of your available cash. Mvelopes deducts the amounts from whichever paycheck or deposit amount you’ve allocated for funding. It also saves all the data as a “funding profile” so you can easily replicate the funding process next time if you wish. As Mvelopes imports bank transactions, they are automatically assigned to budget categories, though you can manually customize them. Exceeded category budgets are displayed in red, and you’re prompted to refund the envelope. 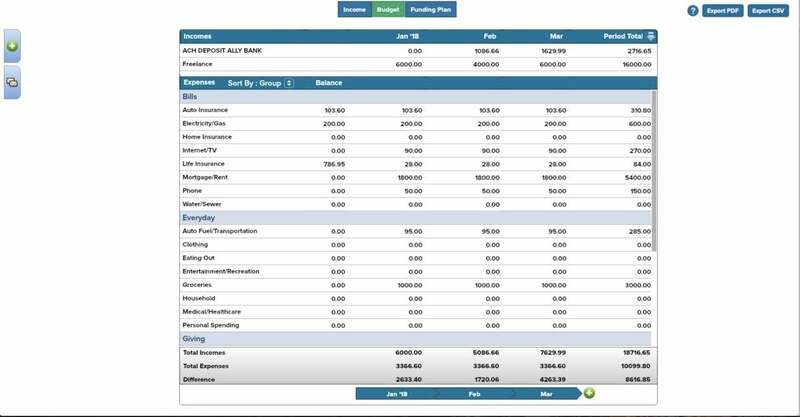 You can also run an array of reports to track your cash flow, envelope spending, net worth over time and other trends. Note that while Mvelopes will let you connect to brokerage accounts so you can see how they contribute to things like your net worth, you can’t monitor or manage those accounts from the app. Mvelopes offers three plans. 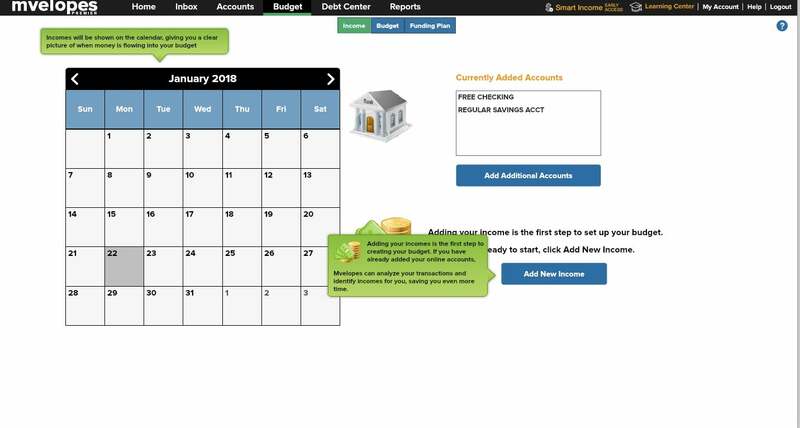 Basic gives you the envelopes budgeting system outlined here, along with live chat support and weekly webinars for $4 a month after a free 30-day trial. The Plus plan adds debt reduction tools, one-on-one setup assistance, high level priority support and quarterly checkups with Mvelopes Personal Finance Trainer for $19 a month. The top-tier Complete subscription adds customized planning, trainer-guided financial education and monthly session with an Mvelopes Personal Finance Trainer for $59 a month. For each plan, you can get two months free by paying for a year up-front. 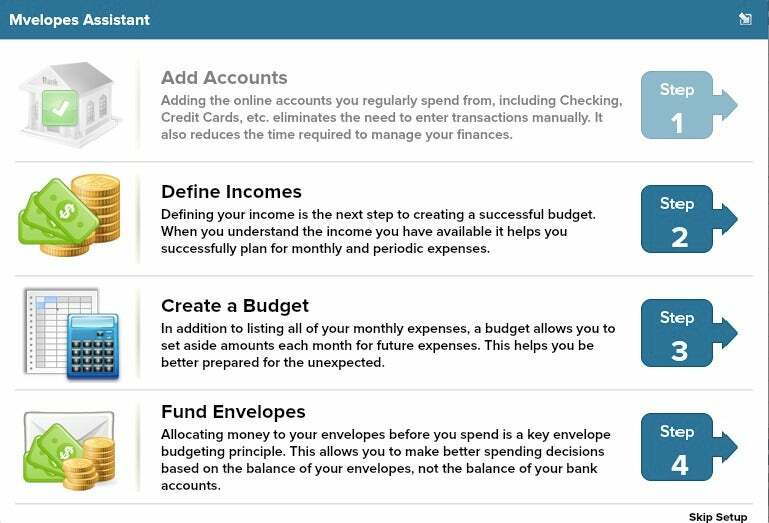 Mvelopes is a solid personal finance tool for household budgeting. Bank syncing and automatic transaction categorization make it easy to stick to your envelope-based plan once you’ve created your budget. The flash-based interface looks a little dated and clunky, and finding your way around the tab-based layout can be frustrating at first. But those seem like minor quibbles once you get the hang of it, considering how quickly it can help you control of your spending and saving. Mvelopes is a good tool built on sound budgeting principles, but its old-school interface needs to go.